One of the coolest things to come out of this bolg has been Awesome Emma, a little girl who burst onto the scene by winning the first annual ZWR Halloween Costume Contest and then showed us all up by revealing that she's a naturally gifted journalist/celebrity interviewer. 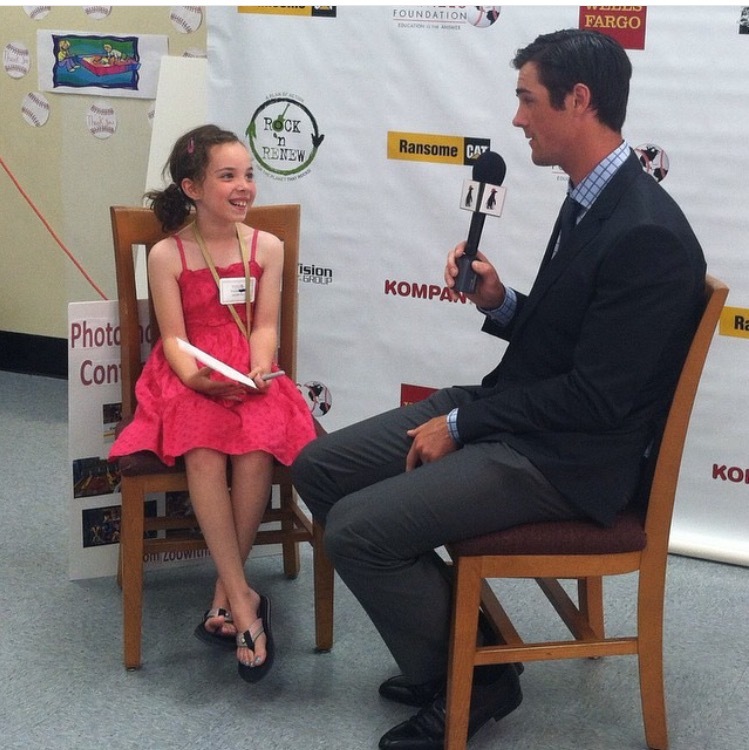 Ever since Emma's first assignment-- a sit-down with Cole Hamels-- the lefty pitcher has held a special place in her heart. She wrote him the following letter upon his being traded, and asked that I share it here. I just want to start out by saying that I woke up sad today when I heard you were traded and I will miss you. You are so well loved by the Philadelphia fans and you brought something so special to the team that no player could ever replace. I do not always agree with the Phillies trades but I have to accept it anyway. You are extra hard to say goodbye to. 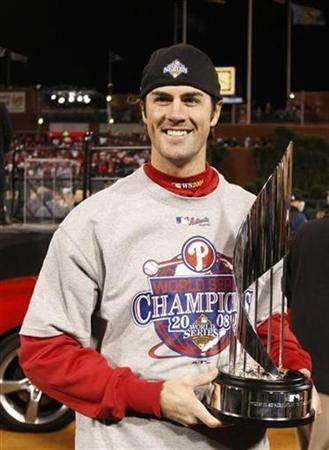 I will never stop wearing my Cole Hamels jersey, in fact I will wear it with lots of pride and respect for you. You are so special and I will always like you no matter which team you play for. You will be so deeply missed and Philadelphia will always love you and give you a warm welcome home. You are just so amazing and this breaks my heart to be writing this. I love how you finished your last game in Philadelphia with a no-hitter. I was so excited and so happy for you. You made history! I learned that you are not only a great baseball player, you are a great man. You have given me so many opportunities from Diamonds and Denim, meeting baseball players, and meeting such a kind person like you. I remember the first time I met you at the elementary school in Philadelphia and I was so speechless because of your good looks. I just want to say thank you for all that you have done as a player. I also want to thank you for teaching me so much about your charity. My birthday is coming up and I mentioned in my invitation that instead of gifts, I wanted to collect money for the Cole Hamels Foundation. I was very inspired by what you and Mrs. Hamels do and how you help people in need and provide so many children with a chance for a better education. I also want to help kids in need and give them a hand and hope to inspire others as you have inspired me. I am happy for you, but I’m also very sad and I hope you win a lot of games for the Rangers. Philadelphia will miss you. I hope the Rangers love you as much as Philadelphia does and you win the World Series. Go celebrate with some mint chocolate chip ice cream. Thank you so much again and I wish you and your family the best. Thank you thank you thank you thank you thank you thank you thank you thank you thank you thank you thank you thank you thank you and more thank you. Thank you for being a home-grown pitcher who turned into a perennial ace. Thank you for Game Five. Thank you for being a World Series MVP. Thank you for being a champion. Thank you for showing no ego when the team brought in other high-profile, high-salary (sometimes bolg-worthy) pitchers. Thank you for not listening to the idiots. Thank you for your charity work. Thank you for being so kind to a little girl who adored you, going well beyond being a good sport. You legitimately made an impact on her. Thank you for that mustache. Thank you for that no-hitter. Thank you for everything, and best of luck. We Found The Girls from the Taylor Swift Concert!!! Well, I mean, not exactly "we", as I didn't find anyone. Kate found them!!! Them, of course, being the two sweethearts who were so amazingly, inconceivably, face-meltingly nice to the Wah. Also, it turns out they really do have a huge Taylor Swift site because their post about it has like sixty seven billionty notes (I have no idea how Tumblr works TBQH I don't even know how to get off the front page but they're basically superstars over there). I'm not sure what I'm going to do next exactly, but I definitely wanted to follow up because so many of you reached out to me upon reading yesterday's post. I can say that in a perfect world it involves, in some fashion, them hanging out with Taylor Swift and hearing from her that what they did was special. That sounds crazy, sure ... but I'm a complete moron and Roy Halladay went to the zoo with me. Stay tuned, and if you feel so inclined spread the word because good people deserve good things. 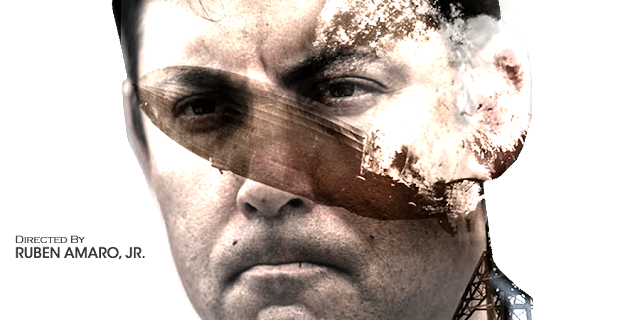 It kind of seems like Rube is hell-bent on burning it all down on his way out the door (presumably, hopefully?) at the end of the season (please?). Of course, saying dumb stuff has always kind of been Rube's thing, so maybe there's no calculation (HA!) to it. We get the baseball team we deserve.